Israeli experts cast doubt about the authenticity of a new radar-evading fighter jet unveiled by Iran over the weekend. Israeli experts cast doubt on Sunday about the authenticity of a new radar-evading fighter jet unveiled by Iran over the weekend. 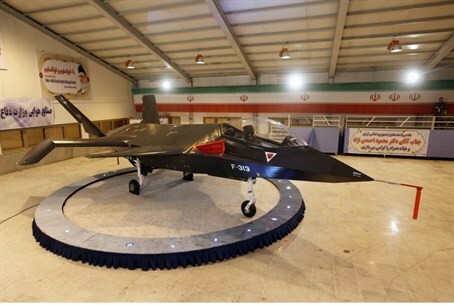 In an unveiling ceremony inside a hangar on Saturday, President Mahmoud Ahmadinejad unveiled the futuristic-looking F-313 fighter jet, saying it ranks among the most sophisticated aircraft in the world. Code-named the Qaher (Conqueror) F-313 and shaped similar to stealth bombers, the grey warplane was designed and built domestically, Ahmadinejad boasted. Israeli experts who looked over the photos that were released of the jet, however, told the Ma’ariv daily they doubted it was authentic. “This is not an airplane, because it does not look like a real airplane,” Tal Inbar, head of the Space Research Center at the Fisher Institute for Air & Space Strategic Studies told Ma’ariv. He added, “It may be a model made out of carton, metal, fiberglass or plastic or some kind of other hard material. Iran has no capability to build aircraft. Plain and simple. But Tehran has succeeded in its propaganda campaign. " Saturday’s unveiling of the fighter jet came as Iran marks the 34th anniversary of the 1979 revolution, which replaced the U.S.-backed shah with an Islamic regime.